Air Force Capt. 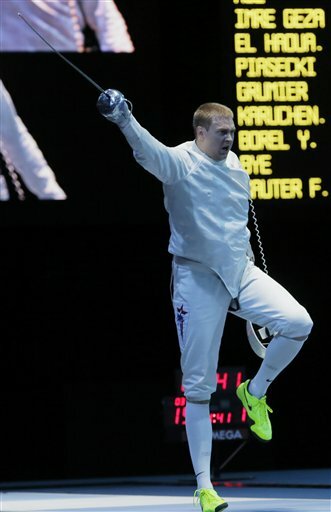 Seth Kelsey reached the men’s epee semifinals at the Olympics in London today, the Associated Press reports. Kelsey is competing in his third Olympic Games. He was ousted quickly from the Athens Games in 2004 and the Beijing Games in 2008, but won his first-round bout today over China’s Li Guojie 8-7, AP reports. He then scored a huge upset by beating No. 1 seed and former world champion Nikolai Novosjolov of Estonia 15-11 in the round of 16. That put the 17th-seeded Kelsey into the quarterfinals, where he downed Venezuela’s Silvio Fernandez 15-9. The men’s epee semifinals are later today. Check back here for the results. 1. Kim Jangmi, South Korea (591, 201.4), 792.4. 2. Chen Ying, China (585, 206.4), 791.4. 3. Olena Kostevych, Ukraine (585, 203.6), 788.6.